A few weeks ago I realized that wintertime is close. It was neither the fresh coat of powdery snow on top of Longs Peak nor the turning of the leaves. It was a woman at Walgreen’s pharmacy, who asked me “Would you like a flu shot?” I started to pay more attention and noticed flu vaccine advertisements everywhere. 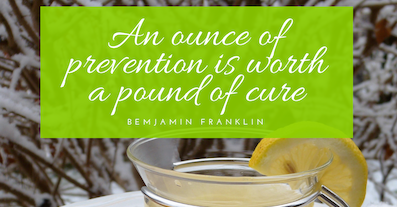 Knowing that an ounce of prevention is worth a pound of cure, I felt it was the right time to write this article to give you lifestyle tips for flu prevention. There are some basis tips that I would like you to read to help you prevent the flu. So the question is, what makes our bodies susceptible to infections? There is plenty of evidence that stress, overwork and lack of rest deplete the body, leading to a reduced effectiveness of the immune system. There will always be stress in our life, so we need to find ways to manage it. One of the best (and cheapest) methods to reduce stress is physical activity. Find something you enjoy: walking, running, swimming, cycling or whatever else turns you on and do it on a regular basis. The key word here is: fun! Make sure you get enough good, quality sleep. Our bodies regenerate during sleep and our immune system strengthens. Constant sleep deficit will reduce your ability to fight infections. A healthy diet is essential in keeping our immune system strong. There is no way we can build up our resistance if we eat unhealthy. There are many books and continued discussions about what a healthy diet contains. The general rule is: the fresher the food the better your diet. Frozen and canned food usually contains a lot of salt and has been processed, making it less nutritious. If you have to eat frozen food for lunch, make sure you have some fresh veggies in the evening and fruit in the morning. Avoid or at least reduce the intake of refined sugar. Now, assuming you have a good diet, add exercise daily and get enough sleep. Dehydration can dry out your nose and throat, which is your first line of defense. It is important to keep those mucus membranes moist, so hydrate yourself sufficiently. In the Front Range we live at a higher altitude AND in a dry climate, we have to drink water. If you exercise, drink alcohol and/or coffee your body needs extra H2O (remember how thirsty you felt after that Halloween party?). That begs the question what is enough hydration? It depends. General rule of thumb is: take your body weight in pounds and divide it by 2. This is the amount of ounces of water you need per day. Your food contains water as well. Take a good probiotic. Recent studies show that bacteria in the digestive tract (your gut) play a big role in your health. They help keep your digestion healthy, and fight respiratory tract infection. Hopefully these lifestyle tips for flu prevention will keep you healthy throughout this wonderful season! Please note: this article does not replace a medical consultation with your doctor. 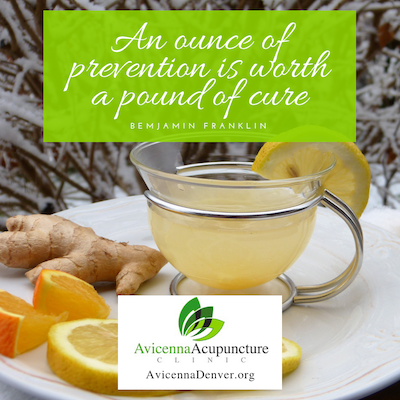 Read our blog if you want to learn more what we at Avicenna can do to help you with flu prevention and treatment using Chinese Medicine.